Paragon Care is pleased to announce the release of a new range of medical refrigerators for hospitals, pharmacies, laboratories and other facilities, including commercial institutions and homes. Covering applications for Vaccine, Breast Milk and Laboratory storage Paragon Care has the complete range to meet all your needs. Vaccine Refrigerators – Our diverse range of vaccine refrigerators, available from 29 to 1615 litres, have applications in all healthcare environments including medical centres, surgery centres and hospital pharmacies. The temperature is electronically controlled between 4–8 O C with digital visual and audible alarms should there be a temperature variance. This ensures vaccines are kept safe at all times. The shelf system is fully adjustable to provide for unlimited storage flexibility. All vaccine refrigerators have been approved by the Pharmacy Guild of Australia’s Quality Care Pharmacy Program. Breast Milk Refrigerators – The range of breast milk fridges are specifically designed to provide a temperature range between 2-4 O C with even temperature throughout the cabinet. These units offer digital visual and audible alarms should there be a temperature variance. They are available from 29 to 400 litres. Laboratory Refrigerators – Our range of Laboratory refrigerators are available from 400 to 1614 litres, with either single, double, or triple door versions. Heavy duty, high quality construction ensures reliability and durability for laboratory environments. The shelf system is fully adjustable to provide for unlimited storage flexibility. 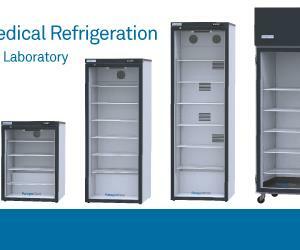 There is also a range of intrinsically safe laboratory refrigerators available.